Conversely, though, some games which are difficult to talk about in conventional terms reveal their appeal in this light. Here’s one: Phoenix Wright: Ace Attorney – Dual Destinies. The fifth title in a series of visual novels, it came out for the 3DS eShop earlier this year, and it makes some choices I may never have seen another videogame make. Here are its verbs: Reading and synthesizing. 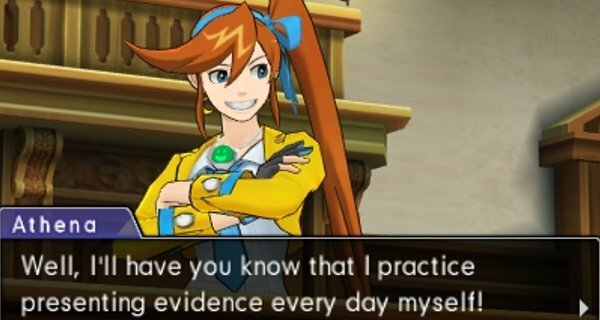 Dual Destinies is—all Ace Attorney games are—a game designed to move at your pace. Play advances as you read, one line of dialogue at a time, the world waiting for your go-ahead. You’re never punished for your reflexes, only rewarded for your insight. Its verbs, you might say, are passive. In the game’s fiction, you’re a lawyer tasked with defending clients against horrific charges, and therefore also drumming up the evidence and testimony to support them. Dual Destinies provides you only with places you need to go, collects only inventory you actually need, and will not advance the plot unless you’re fully prepared for what’s next. Crime scenes highlight areas of intrigue for you. Sidekicks, musing aloud, telegraph your next steps. For all the DNA the game shares with Tex Murphy or L.A. Noire, there are few ways for you to lose the thread, and fewer ways to lose the game. In the beginning, Ace Attorney was a closed trilogy. Its lead, the optimistic Phoenix Wright, rose from humble beginnings to become a superlative attorney—a credit to his office and hero to his clients. Each game contained several cases, each with their own discrete narrative, be it comic, or tragic, or both. There was an additional metanarrative, spanning each game’s set of cases, which would itself be resolved with a game’s final case’s verdict. As a result, each final case was multiclimactic, drawn out to television-finale lengths, with multiple false stops, grand reveals, and betrayals. The entire trilogy’s final case, as you might imagine, was practically orgiastic. The series was a cult success, and Capcom responded first by remastering the series for the DS, then by localizing it for other languages, and finally by releasing a sequel, Apollo Justice. No trilogy, I suspect, can accept a fourth without some discomfort. 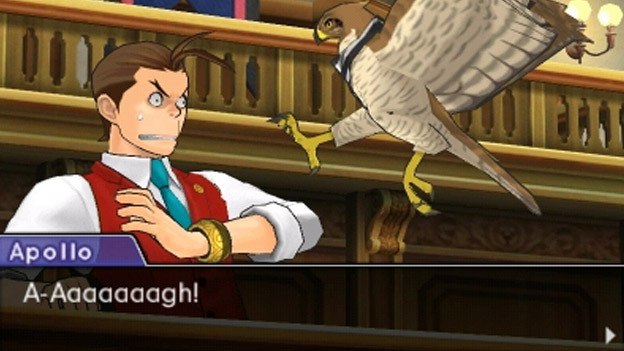 Apollo Justice attempted to reboot the series by introducing a new titular character and placing Phoenix, our old, familiar protagonist, just out of our reach, on full-time Metanarrative Development Duty. This, of course, is where it went sour. Apollo and his sidekick, Phoenix’s daughter Trucy, spent the game in each other’s company, and somehow never managed to develop any chemistry. The secondary character you spent the most time around, former teen wunderkind and forensic scientist Ema Skye, was written into an unpleasant and unhelpful young adult. And all the while, Phoenix lingered in the background, preventing the series from making a clean break from its past and keeping the narrative from making daring choices or sweeping changes. The title sold unexpectedly well, but the experience of playing several foreign and underdeveloped characters while the beloved series lead strolled around, just out of reach, resonated poorly with series faithfuls. And of course it did, for this had been the rare series that seemed to understand the basics, if not the details, of strong narrative. So now we return to the present, with the release of Dual Destinies, which represents a return to form for the game’s own intra-case narrative. It does something terrific at the same time, though: It undoes the narrative damage wreaked by Apollo Justice, and it does so while constructing a robust scaffolding for future n-entry sequels, regardless of primary narrators, and it accomplishes all this without being tremendously obvious about it. It balances the stable of protagonists. Two attorneys was both too many and not enough. Apollo Justice’s frame story concerns Phoenix, and so Phoenix, who we know, upstages Apollo himself, who we do not. With the series’ charismatic icon breaking strange and chasing ghosts, Apollo is left with little room to establish his character or develop his personality. He isn’t unpleasant, mind; you just never get a chance to know him very well, and you are always more interested in why his boss is suddenly skulking around in sweatpants. Dual Destinies introduces hotshot rookie Athena Sykes as a playable character from the outset, and from the jump everything is improved. Sykes is actively engaging—that’s a start. With a third attorney on the team, a sort of protagonist rotation kicks in: a different pair of the three attorneys works actively on each case, giving everyone a chance to play lead, or sidekick, or third wheel. Where Apollo spent most of Apollo pressed into service, having a choice of protagonists allows for characters to only show up as often as necessary. The third protagonist, meanwhile, is free to inhabit the narrative more passively, or to build out the metanarrative, or to pull rank and cool out at home. This makes for a marked improvement. Underdeveloped characters need not be pressed into the same dialogue tree like frosh at a Winter Formal. The relaxation in the narrative framework is practically tactile. It codifies the Lawyer Evolutionary Cycle. Immediately after Athena’s introduction, the game visits upon Apollo several horrifying injuries, and, as Phoenix did before him, he bows out for his own moody character development vacation quest. So begins what I term the Lawyer Evolutionary Cycle. For Phoenix in the original trilogy, and for Apollo in Dual Destinies, tragedy is the stone upon which an attorney is hardened. The first scene of the first Ace Attorney game has Wright stumble upon the corpse of his boss and mentor, Mia Fey, and the drama he undergoes in Apollo Justice steels him well; he is a calm, steady-handed professional by the time he has to play father figure to an entire cast in Dual Destinies. This is the Cycle: Tragedy, moody phase and rebirth; tragedy, moody phase and rebirth. Apollo’s own transformation in this game has similar repercussions, and by the final scene, the protagonists have achieved a linear gradient of maturation. Wright mentors Justice, and Justice mentors Sykes, and we begin to wonder who Sykes will mentor in the next game, or the next. Apollo Justice was at its most leaden when Apollo the Neophyte traveled with Trucy the Unconcerned; it is hard to imagine the blind so leading the blind again. It adds perspective to foreshadow further character development. Throughout the game’s original trilogy, Wright squared off most often with prosecutor Miles Edgeworth, his boyhood friend and his ultimate courtroom nemesis. As rivals and as equals, Edgeworth’s progression towards mastery of his craft matched Wright’s step for step; where Phoenix was mercurial and brilliant, Miles was exacting and calculating. There is an embarrassment of fan fiction about this. When you meet him in Dual Destinies, however, things have changed. Edgeworth has risen to the rank of Chief Prosecutor, an office which commands him great respect and authority; you, conversely, still run a modest legal office on a shoestring budget. Edgeworth is happy to see you, and when the chance comes to face off in court, he leaps at the change, but he regards you differently from his new station. Suddenly, even though you’ve won all these cases, you feel for the first time like maybe Edgeworth has…double-won? It feels weird. Videogames tend not to qualify your victories. Attaining money or rank is never the point of Ace Attorney, of course, but having Wright’s former foil surpass him so profoundly gives the game some much-needed context. We see not only how far Wright has come, but how much further he could go, as well. Throughout the series, you fight for truth, and justice, and other worthy ideals, but for the first time it feels plausible that you might also eventually fight for a better office. One of the themes running throughout the Ace Attorney series is perseverance. Most good cases contain at least one near-fatal ebb in contradictory testimony; it is at these lowest points, Phoenix sweating and clutching his skull, that the defense manages to summon some hidden reserve of energy, and with it, the truth, and justice. Ace Attorney could have ended with Apollo Justice. Dual Destinies could have tried to play it safe. But rather than that, it took a great risk to meet its own great standards, and in doing so, became instructive: Should anyone decide to follow in Ace Attorney’s footsteps and attempt their own serialized narrative drama, there now exists not only the game itself, as exemplar, but this lesson in how to fix your mistakes and plan for the future. Just read and synthesize. 3. Like, if you’ve got other suggestions, I’m basically dying for them. Stephen Swift lives in Boston with the world’s tiniest and loudest cat. He has previously been published in the Village Voice, Maura Magazine and Nintendo Power’s Classified Information.